I just hate it when my Christmas lights get all tangled up. 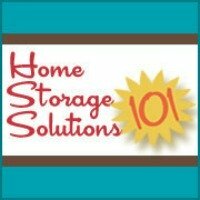 Use this simple Christmas light storage trick to solve this problem. My family just recently got out the Christmas decorations to decorate our Christmas tree, and it made me think of this quick trick for Christmas decoration storage I wanted to share with you. 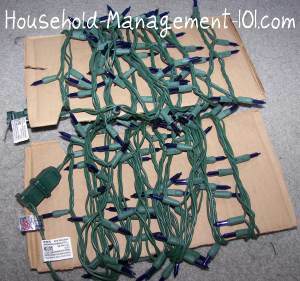 For years, when we would get out the Christmas lights, just shoved into boxes after taking them off the tree at the end of the previous Christmas season, they would be all tangled up. Then, we had to detangle the lights for a good long while, sucking away a good part of my Christmas cheer. Finally, my Dad solved our problem for the cost of $0.00. That's right -- all you need is some scissors and old cardboard boxes, and you can make your own Christmas light storage reel. They last for years too once created. To the left is a picture of the homemade reel (actually two of them), without the lights on them. It is quite simple -- a flat piece of cardboard with a notch cut into the top so you can wedge the beginning of one strand of Christmas lights in there to get it started. The real beauty of this system comes when you are unpacking the lights the next season, and they just unroll right off with no need to detangle them. An added bonus is that it makes putting the Christmas lights on really easy too. It can be difficult to loop the lights around the tree without getting snagged sometimes, especially at the beginning of the strand. Using these homemade Christmas light storage reels you just walk the reel around the tree, slowly unwinding the lights as you go so you don't have any snags. Since we've done this the Christmas lights part of decorating the tree is so much easier and quicker, so I highly recommend it, especially for the price! These reels can also be used to store your outside Christmas lights too. 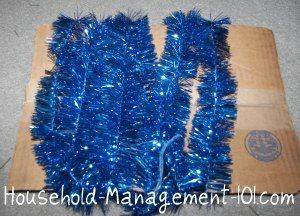 We also use them (see picture above) for Christmas garland storage.